Chef Menteur, whose name is possibly French for “chief liar”, is an instrumental band whose work has been described as being everything from electronica and post-rock to progressive rock and experimental jazz. Formed in 1998 by Jim Yonkus (bass, percussion and xylophone) and Alec Vance (guitars and a huge range of vintage keyboards and noise making devices), they recruited Dan Haugh (drums and lots more noises) to record “We Await Silent Tristero’s Empire” in 2005. Following Hurricane Katrina, the Chef Menteur reformed and were one of the first bands to play in the city, when the lifting of the curfew order allowed residents to return home. In 2006, they worked with other Backporch revolution artists to release the compilation “Proud To Swim Home”, a benefit project for musicians who had lost instruments in the flood. 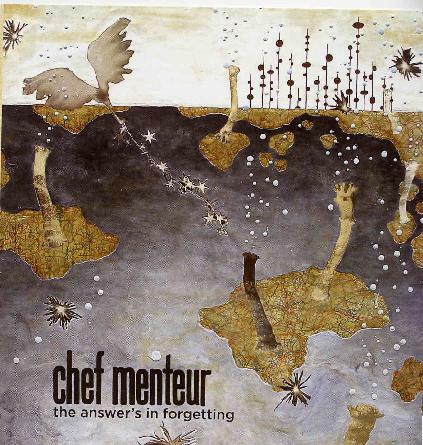 “The Answer’s In Forgetting” is Chef Menteur’s second official full-length album, and features newest member Brian Abbott on sitar and banjo for the album’s closing number “OT III”. Elsewhere, Yonkus, Vance and Haugh work hard to produce huge walls of sounds using such diverse instruments as Theremin, miniMoog, dulcimer and homemade oscillators, alongside more conventional drums, bass, guitar and keyboards. The result is blend of heavy rock and experimental drone, exemplified on the seven minute “1491”, which sounds like an instrumental cover of Led Zeppelin’s “Kashmir” as performed by Gary Numan. Meanwhile, “Deathless” almost sounds like some of The Verve’s spaciest moments before bringing in a menacing guitar riff that Tony Iommi would not be ashamed of. A few tracks feature the wordless vocals of Alec Vance as yet another instrument in the densely layered mix. “The Answer’s In Forgetting” is a fine album by a genre defying band who have created a moody and atmospheric collection of tracks likely to appeal to fans of post-rock and neo-psychedelic rock. Highly recommended.